There are many features for plastic parts that are best implemented through injection molding. Today, we’re looking at the “living hinge,” a specially designed bridge between two pieces that works like a traditional hinge, but without the need for using new material or assembly. Specifically optimized for injection molding, a living hinge is a great tool when it comes to optimizing parts for injection molding. Let’s look at how they work and common types to use in your next project. What is a Living Hinge? Moving parts typically require multiple materials, parts, and assembly. Living hinges instead incorporate the hinge directly into the material of the entire part, a plastic bridge between two parts that are very slim and flexible (typically polypropylene or other flexible thermoplastics). When properly engineered, these hinges can rotate open and closed for thousands of cycles before wear becomes a problem. These hinges are prevalent in the world and can be found on a variety of products from makeup compact and condiment bottles to residential and commercial containers of all sizes and uses. Living hinges reduce the parts and assembly time of a product immeasurably, translating to high production speed and lower costs. It is also versatile, with different variation providing additional features for the product. Flat Hinge: The most common type, this is the simplest type of hinge, meeting the edges of two flat landings with a thin hinge section. Butterfly Hinge: Adding to the complexity, this hinge flips between two states. Once the lid is opened or closed past a certain angle, the hinge will snap the rest of the way to the open or closed position. Double Hinge: A double hinge incorporates two hinges instead of one, either to provide a needed gap between two folded parts or to allow a greater (up to 360 degrees) rotation. Bi-stable or Triple Hinge: Bi-stable hinges work similar to butterfly hinges in that they have natural resting positions in both open and closed, using three hinges. A triple hinge incorporates three hinges to make the hinge stop at a certain angle. Much like living hinges can reduce the cost and time to the assembly of a part, injection molding is the fastest and cheapest way to produce them (see our blog, Five Advantages of Plastic Injection Molding for more details). 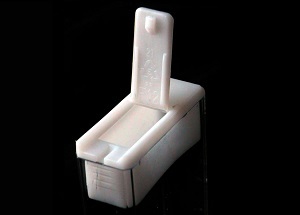 If you’re looking to incorporate a living hinge and other optimizations for your plastic parts into your injection mold, make sure to talk to your mold designer early in the design process. They can help you figure out if a living hinge would fit your needs and how to optimize parts for plastic injection molding. Ready to get started? Looking for assistance? Midstate Mold & Engineering can help. With more than 180 years of combined experience in injection mold design, tooling, and parts production, we can assist you with every step of the process, from prototype design to making the mold to state-side parts production. Want to learn more? Contact us to consult on your current project, or you can directly request a quote on any or all of the services you need.